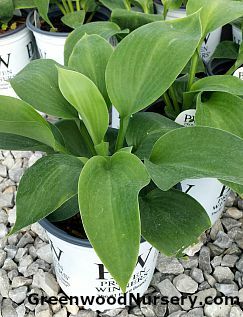 Tauted as the largest hosta available, the Empress Wu Hosta is a giant upright growing hosta. This Proven Winner Hosta is topped with violet flowers from early to mid summer that attracts hummingbirds and bees to your garden. Growing 3 to 4 feet tall and spreading up to 6 feet wide, you'll want to space the Empress Wu Hostas about 5 feet apart. Hostas grow best in moist, well drained soil that has high organic matter content. Full to part shade is always best. In fall when frost nips your hostas, be sure to clean the dead foliage away to prevent insect problems. Though the leaves of the Empress Wu emerge in spring with blue tinting, as they mature to their over 2 foot length, the waxy coating fades way to a shiny deep green. This self-pollinating hosta is a cross of H. 'Big John' developed by Brian Skaggs and Virginia Skaggs in Lowell, Indiana. The name Empress Wu Hosta honors the precess who was the only famale emperor in history of China (Wu Zetian - 624 AD to 705 AD). Thank you to the Missouri Botanical Garden for that information. Empress Wu Hosta is grown in the PW one gallon container. Orders shipping to AZ and CA will be bare rooted and root washed before being prepped for shipping.